I have just returned from what I can only describe as an epic, life-altering journey to New Mexico and Colorado. I have always felt drawn to the West, and any chance I have to visit, I take it. This trip was on a totally different level however. I’ll do my best to explain, but please know that nothing I can write here will do the experience justice. The trip came about as I was introduced to Lisa Dee and Vista Caballo through my friend Lewis. We are in the process of doing various work together, and during this work, the inaugural Horsewhisperer Experience came up. Before this, I had very little knowledge of horses or equine culture, but I felt a connection forming from a distance. In my work with Vista Caballo, I poured over all the website content and got a sense for the possibilities that awaited me. Little did I know just how much of an impact it would have on me. Before I go on, it’s important to realize that I’m not the type of person who likes to have these things scheduled and structured too much. In fact, I like to sort of let them unfold as they will, and just roll with it. Part of this experience for me was driving instead of flying. I’m so glad I did, for multiple reasons that I’ll describe later. The other caveat is that I was totally offline for 3 days, and parts of 2 other days during the trip. In effect, I was out of communication for 5 days straight, which I have not done in a very long time. I’m a road warrior and the drive out sort of flew by. I did Atlanta to Amarillo, TX with only 2 stops in between. Yes, I’m that crazy. It helps that my car can go 600 miles on a single tank of diesel and I have a strong bladder. It really does make the drive go by much quicker to just roll on through. Anyway, day 2 was New Mexico play time. I was looking forward to this the entire drive out, as I’ve had such amazing experiences in New Mexico before. This trip was no exception. 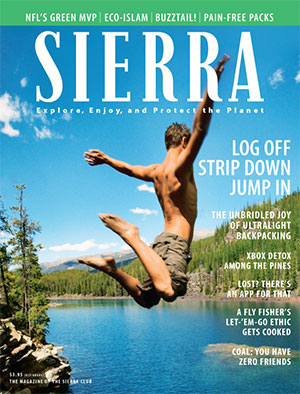 Before I left Atlanta, I had received the July/August issue of Sierra magazine, which had a picture of a guy jumping off into a beautiful lake. I commented to a friend of mine that ‘I want to be that guy.’ I brought the magazine with me and had it sitting on the passenger’s seat of the car the whole drive out. I suppose on some level, I knew I would manifest that experience, and I did – almost exactly. While I was driving through the desert, I stopped a couple of times to have a little picnic and take some photos. 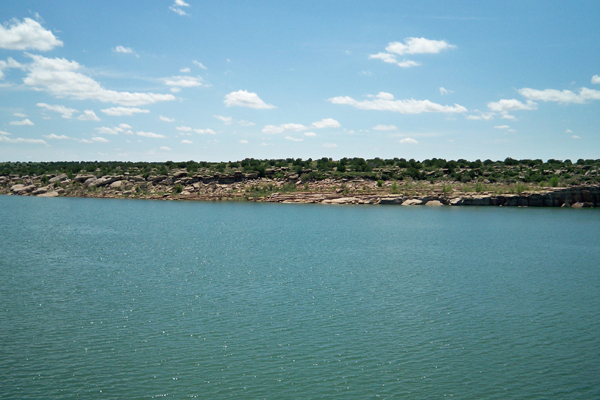 As I continued, I saw signs for Conchas Dam and Conchas Lake State Park. I couldn’t resist turning in to see what it was all about. Amazingly, this lake provided the exact scene that I had seen on the cover of Sierra magazine as seen in the picture below. I parked and went down to the edge of the lake and walked along the rocks where I ran into some local kids that had been swimming. They sensed that I wanted to jump in and asked me ‘You looking for a place to jump?’ They showed me the spot on the rocks and before I knew it, I was recreating the scene from the magazine. The water was cool and refreshing – an incredible departure from the hot, dry desert I had been walking in just minutes before. Awesome!